Zest one fifth of the lemons, and juice all of them. 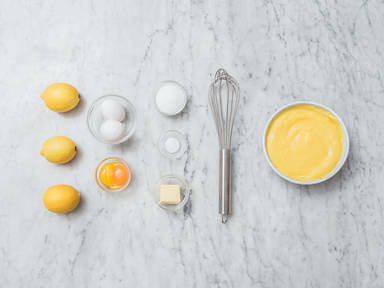 Whisk together the zest, juice, eggs, egg yolks, sugar and butter with a pinch of salt in a pot. Warm over medium-low heat, whisking constantly, until it starts to thicken, approx. 10 min. Remove the pot from the heat and strain the curd through a fine sieve into a bowl. Cover the curd with plastic wrap, making sure the wrap is in direct contact with the curd to avoid a skin from forming. Refrigerate and enjoy for up to 2 weeks!